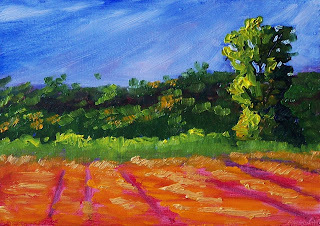 Today's painting is a 5x7 inch landscape oil painting was inspired by a sunny afternoon last weekend. It was wonderful to see the sun poking out again. My idea was to capture the feel of the sun as it filters through the trees and spreads its fingers across the land. Though a little abstract, I like the results. This 5x7 oil painting is one I created last month. 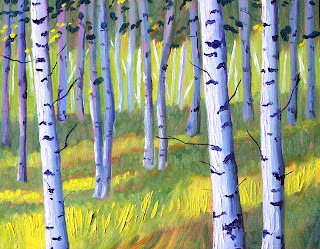 It has areas of thick impasto, especially in the tall grass of the foreground. It is reminiscent of those damp October mornings that occur in the fall. I have decided to list it in my Etsy Shop. It can be purchased for $35.00 plus $6.50 for shipping to US addresses by clicking here. Spring is appearing in starts and stops. A beautiful glimmer of sunshine is followed by a drenching downpour. A hail storm is followed by a day of record high temperatures. 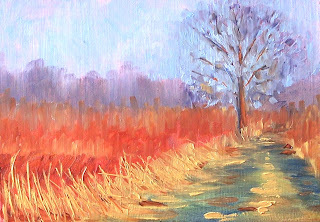 Today's 5x7 inch oil painting is about the coming of spring. It is just around the bend, and I'm excited for more sunny days. 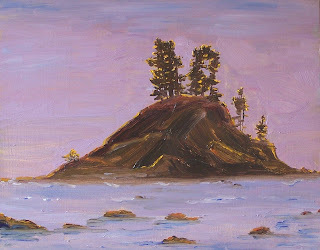 Today's painting is based on a clay bank on the North Pacific Coast of Wasington State. I like te way the red of the bank contrasts with the evergreens that cling to the top of the cliff. The beach is wide, beautiful, and often full of clam diggers. I have listed this 5x7 inch oil painting in my Etsy shop. You can purchase it for $35.00 plus $6.50 for shipping to US addresses by clicking here. The cattle called to me again this morning, but it may be the last time for a while. 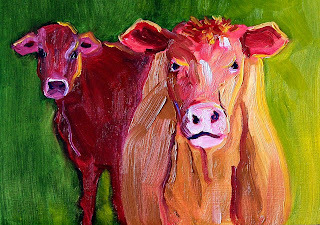 After I painted this little 5 x 7 pair, my desire to continue my bovine painting quest seemed to wain. I'm headed out into the sunshine that finally showed up. Snapping some photos of spring is where the world is moving me next. Inspiration always seems to start anew when the weather is warm and the sun is generous. Today this 8 x 10 inch oil painting emerged from my imagination and a recycled hardboard panel. It seemed wasteful to let a good panel go unused, so I started to work. At first it seemed I was destined to created another candidate for wipe off, but I kept working and soon it was sunset on a field of birches. Today I was rearranging my studio, moving some work to use the space more efficiently, and I ran across this littl 5 x 7 oil painting. 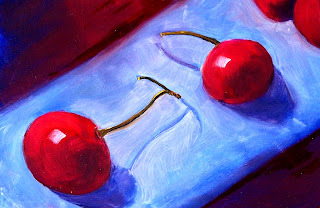 It is one I painted last summer at the heighth of the cherry season. I'm looking forward to the season of summer fruit again. 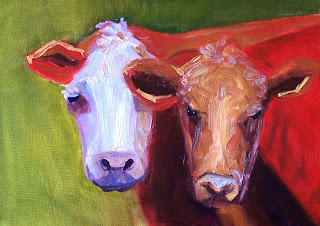 This pair of cows has captured my love! Their awkward shapes and personalities were a delight to paint. As they looked on with blank stares, I wondered if they were mad at my intrusion. 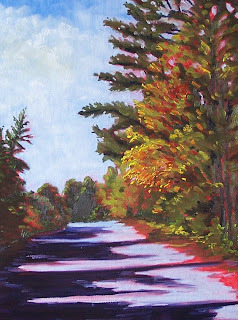 The painting was completed in oils on a 5 x 7 inch hardboard panel. This 5 x 7 inch oil painting was inspired by the beautiful colors of a spring garden. It is wonderful to see folliage beginning to develop and the flowers poking their heads out. I listed this painting in my Etsy Store this week. You can purchase it for $35.00 plus $6.50 shipping to US addresses by clicking here. I also ship internationally, so if you would like to check shipping charges to everywhere else, click on this link and scroll down to find the international shipping charges. This is today's efforts. This painting is another one with a red underpainting. I really like the way the red shows through and adds warmth. This oil painting was done on an 8 x 10 hardboard panel. This pair of Canadian Geese provide a beautiful silhouette as they stand in front of a misty pond. Unfortunately Canadian Geese have become a huge problem for a lot of local parks. 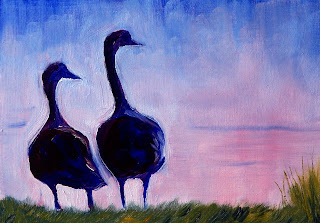 It was interesting painting the shapes of those long necks and rotund bodies in this 5 x 7 inch oil painting. What more can I say? 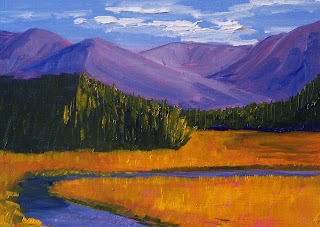 The colors of the mountains and the fields were an inspiration for this small painting. It was listed for sale this week in my Etsy shop, but sold immediately. I had so much fun painting my little black and white cow a while back, I wanted to try again. 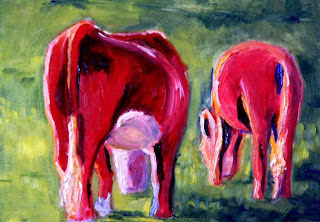 This time a rear view of two red cows was the result. I especially enjoyed painting the mother with her sharp angles and round belly. I'm certain you'll be seeing some more in the future. This effort was a 5 x 7 inch painting. After a little more practice with these small works, I'm thinking of working on a larger version. I'll keep you posted. This is a 5 x 7 inch oil painting that I completed earlier this year. 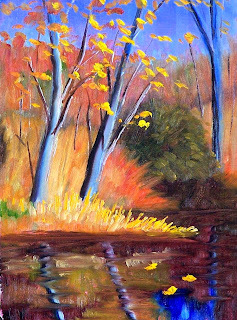 I was inspired by the yellow leaves of the fall foliage when I painted it. 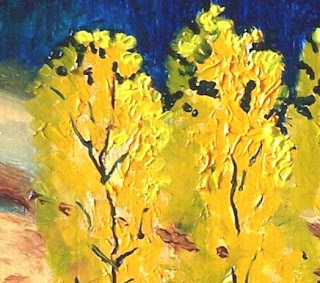 It has several areas of impasto (thick paint) that add character to the work. 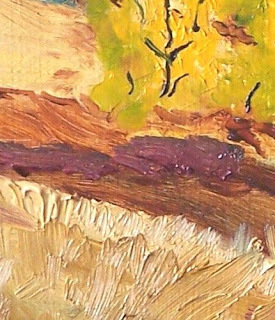 Here is a closeup of some of the impasto. I listed this painting in my Etsy Shop this week and it sold quickly. If you live outside the United States, you can click here to check shipping expenses to everywhere else. 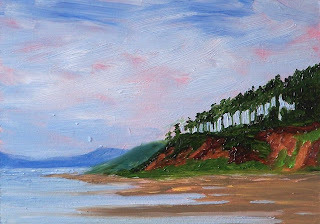 This afternoon I took a quick trip to the coast to pick up a couple of paintings that had been in a show. Unlike the inland where it was raining, the beach was coated in a cool layer of sunshine. I was able to take a beach walk and grab some inspiration from these sun-coated jetty rocks. After picking up my paintings, I headed inland again and back to the rain. It was a magnificent little break from the drizzle that sat on the rest of the Pacific Northwest Region. This 8 x 10 oil painting is a little reminder of my afternoon. Today is a beautiful sunny day. Trees are just beginning to leaf out. The air is crisp, cool, and reminds me of the wonderful days of summer that are just around the corner. 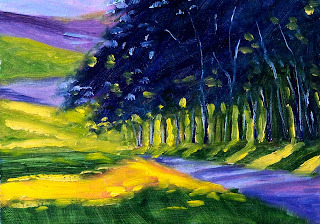 This 8 x 10 inch oil painting was inspired by sunlight, summer, and a peaceful walk in the forest. The Northern Coast of Washington State is punctuated by rocky formations. This is very typical of many of them. 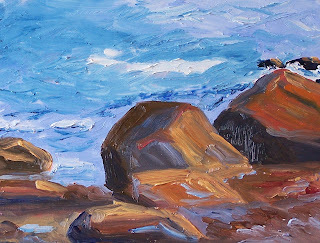 I painted this particular rock from an old photo. I haven't visited the coast this far north in a very long time. This summer perhaps I will venture there again and see if I can locate the name of this particular rock. 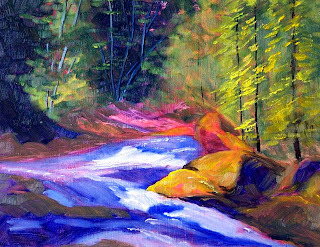 As some of you know, one of my favorite painting subjects is Mount Ranier in Washington State. 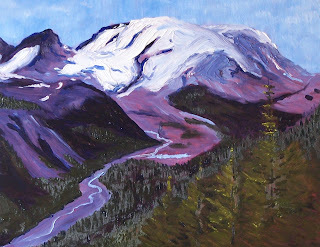 This particular painting is of the Nisqually Glacier as it rolls down the mountain and sends water into the Nisqually River. To be near the glacier and this absolutely beautiful landscape is breathtaking. I tried to capture the grandure in this 8 x 10 oil painting. If you have never visited this beautiful mountain, I suggest you plan a trip for this summer. You won't be disappointed. 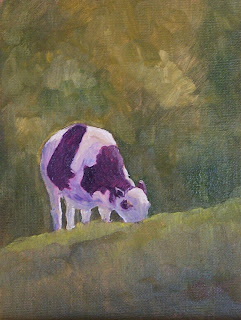 I've never painted a cow before; this is my first attempt. She was really fun to paint. Cows have such odd angles and bulges; they make for quite an interesting subject. This one grazing on a hillside enticed my imagination. She was completed on a 6 x 8 inch canvas panel using oil paint. When she dries, I will probably put her up for sale in my Etsy store though I am rather attached to her at this point. I played with color again today. This 9 x 12 oil painting on stretched canvas was begun with an underpainting using three values of Grumbacher Red. The canvas where the sky was to be painted, I left untouched. I started by painting the sky with a combination of Cobalt Blue, Titanium White. I then mixed several shades of green from a combination of Cadmium Lemon Yellow and Mars Black and begin painting the darkest greens first. I left some red showing through because I like the depth it created. I moved from the darkest greens through to the lighter and concluded by using pure Cad Lemon on the focal point--the nearest tree. The shadow was created with a mix of Grumbacher Red and Ultramarine Blue. On the lighter part of the road, I used the sky color. I left the edge of the foliage along side the road untouched so the red of the wash still shows. The very last thing I did was go back and touch up the sky with a tiny touch of Cadmium Yellow and Titanium. This painting took about two hours to complete. I rather like the results and will probably use this approach again with a different subject. I have several in mind and am anxious to try again; unfortunately, I've have some other business to attend to before the opportunity will arise. Until then, I will dream about the color red. 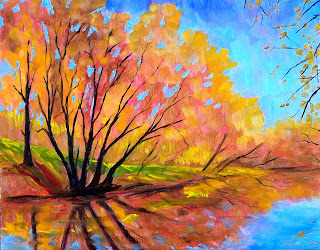 Playing with color is what I did with this 8 x 10 inch oil painting. Sunshine and reflections against a brilliant blue sky emerged as my brush made its way across this hardboard panel. 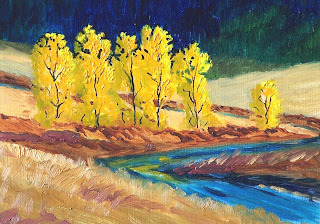 I started with a wash of alizarin crimson and built the trees with cadmium yellow, the sky with cobalt blue and a little titanium white. 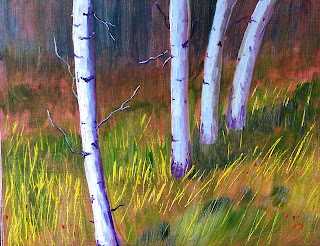 Alizarin and sap green make a nice mixture for the dark trunks of the trees. Various mixtures of sap green and lemon yellow created the highlights and the backlit shoreline. 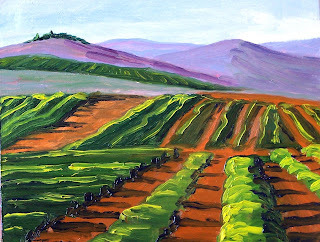 This 8 x 10 oil painting was inspired by the vinyards of Central Washington State. The Yakima, Columbia, and Walla Walla Valleys, among other Washington locations, offer great touring opportunities. According to Wines Northwest, many Washington vinyards are located at the same latitude as the great French wine regions of Bordeaux and Burgundy. Here is a link to some Tour Guides and Driving Services if you want to take a trip through the area. Although spring is approaching, I still have fond memories of the brisk days of fall. 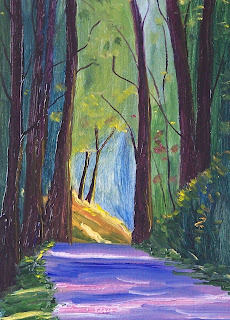 This little 5 x 7 oil painting is based on a view of Woghop Lake at Fort Steilacoom Park in Western Washington State. It is not very far from the grounds of the historic Fort Steilacoom and really is more of a pond than a lake. This painting has SOLD.